Visit the venues that host Australia’s favourite sporting events. 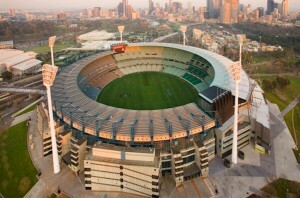 Visit the MCG, Flemington racecourse, home of the Melbourne Cup – the race that stops the nation. Drive through the Commonwealth Games 2006 Village and around Albert Park, on the Melbourne F1 Grand Prix Circuit alongside Melbourne Sports & Aquatic Centre. Tours depart Monday to Friday at 8.30am from Federation Square (At Melbourne Day Tour Centre) and return at 1.30pm. City Hotel pick ups available on request.